As any wedding photographer knows, one of the most nerve-wracking events is when a guest completely destroys the picture perfect moment you've been hired to capture. Whether they stand up in the aisle during the first kiss, take photos with their ipad in front of your camera, or inadvertently cause half the family to look off to the side during posed family portraits, wedding photo bombs can be a real headache. Wedding photographer Corey Ann's suggestion is having an "Unplugged Wedding". What exactly is an unplugged wedding? An unplugged wedding is when you ask your family, friends and guest to turn off their phones, ipads, cameras and other digital distractions during the ceremony or reception. The purpose is to allow the hired wedding photographer the chance to capture the wedding as efficiently and perfectly as possible without possibly missing key shots caused by obtrusive guest photographers. You can see many examples of failed photographs caused by guests overstepping their boundaries on Corey's full Unplugged Weddings Blog Post. As a wedding photographer myself, I can attest that there have been times when "Uncle Canon Charlie" has not only become an annoyance at my own weddings, but he has also been responsible for me deleting images that would have been album worthy. I guess dodging guests who intrude on your hired responsibilities is just something that comes with the territory. After reading Corey's great argument for hosting an unplugged wedding, I'm left wondering if it might be going a bit too far asking guests to refrain from taking personal photographs during the ceremony and reception. If a guest wants to jump out in the middle of the aisle with his iPad to capture the couple's vows, am I really supposed to stop him? If I capture him in the aisle, isn't that a recorded account of what actually happened at the wedding? Are we wedding photographers a bit too sensitive on creating the perfect photos that we see wedding after wedding instead of embracing the spontaneous moments that make each wedding different? "I would kill to work at an unplugged wedding, but guests are only a nuisance. You have to plan to get around all the nonsense." "I'm sorry that this wedding photographer thinks she has it "hard." But she's getting PAID for this work and is supposed to be a PROFESSIONAL. A professional should know how to get the job done in less than ideal circumstances. That's part of being a professional and she should just deal with it instead of bitching about it in a blog post." "If I'm a potential client and I come across the blog post, I might think to myself "this photographer can't handle herself and get the shots she wants." 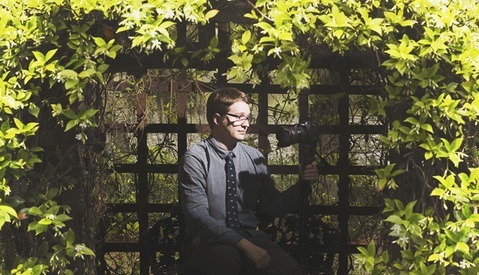 That might influence the decision I make on which photographer I hire." "Yea, I get OP's rant. But I don't think it's as bad as she makes it sound. I guess it depends on personality. Most photographers, at least the ones I know, are not Type A personalities, but go-with-the-flow people. The Type A's have a shot in mind, and that's what they want to get. My view: 1) Capture what's already there; 2) there's no problem that one can't dodge or work around." After shooting about 200 weddings myself, I personally feel like guests with cameras pose mostly as a nuisance more than anything else. Have I missed a few important shots here and there because of an overly ambitious guest? Sure. But with the help of my second shooter, it's pretty rare that some key moment isn't documented at all. I've also never had any problems with the flash from a guest's camera during posed photos or key moments. The bigger problem for me is family members looking at someone else with a camera instead of my camera, but that can easily be taken care of by being loud and in charge. In fact, sometimes guests can enhance a wedding photograph if you anticipate their flash and include them in the overall composition. 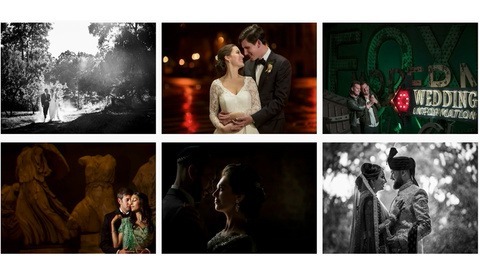 So what do other wedding photographers think about the concept of having an Unplugged Wedding? Leave your comments, stories, and thoughts below. How silly. It's part of the challenge. It's not about the photographer, it's about the people and the photographer is there simply to document it. I think it's a great idea... The people are watching with their eyes and focussing on the moment ... not on their cell phones. It's good for everyone! The photographer is there to document phones and tablets and peoples backs? Really? I am sure the client would love that. I have been around a while. I have to say, I don't remember guests taking photos during the ceremony before the late 90s or early 00s. It just did not happen and would have been considered rude. The reception is a different matter all together. Actually its not about the people its about the couple. If the couple wanted the cousin take the picture they would have not hire a photographer. We're talkin images that last a lifetime not some snapshots posted on facebook almost right-away and forgotten a week later. Document it you say, I say please let me do so. The wedding is about the couple. A good photographer will talk to the couple about their priorities and help them plan accordingly. Life is all about tradeoffs. Do they want the best possible chance at perfect photos, no matter what? 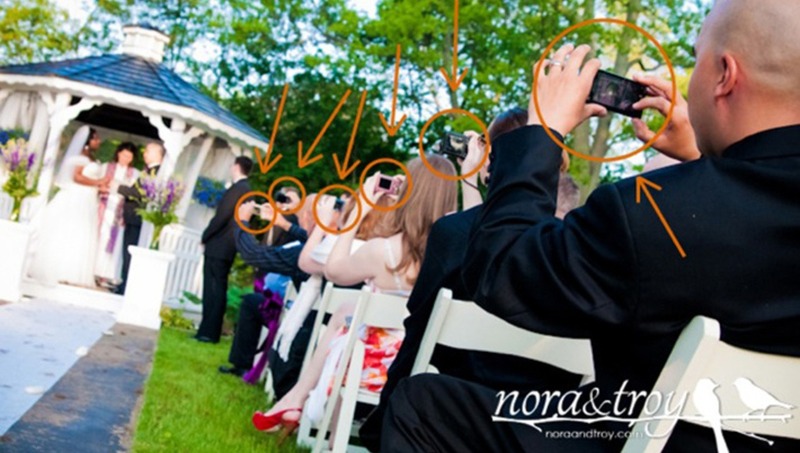 Or is it important to them that their guests to have the fun of taking their own pictures? If it were my wedding, I would ask that guests refrain from taking photos during the ceremony and invite them to go nuts with cameras and social media during the reception. I agree with you, it's our job to talk about it before the wedding with the bride and groom. Ultimately it is up to the couple. As a professional, though, it is our job to guide the couple with our experience rather than just "document it." Most couples don't want the day documented, they want it created. I always suggest no cameras during the ceremony. Then during the formals I tell everyone with cameras that I will make sure they have a moment for a shot after I am done with each pose. The reception is a free-for-all. This is what I believe works best for getting the couple the shots the service the asked for and keeping the family happy. It is my professional advice to someone who has paid money for it. Good luck trying to explain that to the family, that they cant take pictures, only a hired individual with fancy camera can. I agree, this would be awesome, and ideal for photographers, just good luck getting everyone on board. "Grammie, I'm sorry you cant take any pictures of us even thought you've been dreaming of this day since I was born, but you can surely purchase some from our lovely photographer!" Catch my drift? The photographer doesn't have to explain it to the family... You didn't read properly. do you really have to purchase from the photographer? I mean, aren't you kind enough to give a copy to your grammie? I didn't write this post because I'm upset about losing sales. That's actually laughable. I will second what Corey is saying. I don't think I've ever sold a print of the bride and groom at the alter to anyone outside the immediate family or wedding party. The only photos guests have bought from me are photos of themselves dancing. It might not stop everyone, nor should it be strictly enforced unless the couple wants that. I don't think it should ever be the photographer's job to enforce it either. Nor should a photographer be so inflexible that they would demand it be enforced. The point is that some (hopefully, most) will think twice about it if an announcement is made. Peer pressure is a powerful tool. 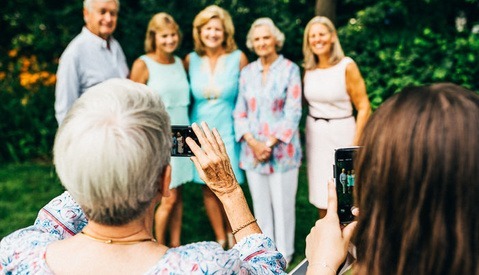 BTW, a photo of Grammie taking a picture would be adorable and the couple would treasure it. A photo of all the d-bags with their iPads.... not so much. Worst idea ever! its 2013! Year is an argument ? Seriously ? it's "aisle". An "isle" is a geographical piece of land surrounded by water. Sheesh! It's amurica, we're all surrounded by water. Thinking about this from the photographers' perspective is wrong in a lot of ways. Please note that the initial suggestion here was from the BRIDE, not the photographer. Sure, we're generally willing to take what's there and work with it, but the couples who are paying for the work want the best possible document, not merely the best you could get under the circumstances. I wouldn't necessarily demand it, but I would suggest it if the couple hasn't already. I agree. If a bride and groom are hiring a photographer, they're hiring her for her professional expertise, which should be operative before, during and after the event. It's the photographer's job to tactfully advocate for the conditions that will enable her to deliver the best possible product in the most unobtrusive way. If the photographer feels that there's a tradeoff to be made between results and obtrusiveness, it's her job to raise the issue with the couple and help them clarify their priorities. My two cents... I think that the times have changed from what they used to be and EVERYONE has a camera on them at all times be it their point and shoot, DSLR, iPhone, iPad etc... As far as not allowing their guest to take photos... I think that is a bit too much... But should someone see that there is a "second shooter" in the audience perhaps a family member or someone else in the bridal party or wedding planner can gently ask them to refrain from getting in the way of the photographer. I definitely think that there will be rude people who like the picture above with the crazy guest and the Ipad... but brides and grooms don't want to wait weeks or months to see moments at their wedding and it is nice to have guest share their images. I guess it really is just down to the groom and the bride how they want to handle this type of situation. It would be the photographers job to inform them how things go down at weddings now and allow them to decide how they would like it handled. And put it in your contract that you will not be held liable should a guest jump up and stand in your way. These days we have gone from prints to digitals, film to memory cards, and now every guest has a camera also. So its just something you have to learn to deal with when you get into the profession of a wedding photographer and eat it. Quit complaining and just go with it... If you dont like it do something else. A newborn photographer doesnt complain about "accidents" its part of the job. I think in these days - or in any days politeness and consideration for others should not go out of style. If the celebrants are your friends/relatives, why would you want to ruin their pictures? I personally love the idea of the "unplugged" ceremony (not extended to the reception). Um, yeah...it deserves the same respect one would give to a worship service and you don't jump up in the aisle at church with your iPad taking shots. Take the hired photographer's responsibilities out of it the argument. We are way too attached to our mobile devices and sometimes they just need to be put away. I can get around those who are trying to grab a shot - most of the time. I just wish that the attendees revered the ceremony the way they used to. I like the idea, it's great to see a bride who realizes that all the clicking will cause a distraction. If anything maybe announcing that there will be a set aside moment for anyone who wants to take a photo to do so, but that during the ceremony they request only the paid photographer to do the shooting. True it maybe part of the job for the photographer to work around people taking photos but the family is paying to get the best shot. Having to wait or move around someone shooting with a cellphone may cause that special moment to be lost, the paid photographer is suppose to be getting the good shots.